Jacksonville, located in the northeast region of Florida, is home to many museums and galleries, and is also a bustling center for business. The plethora of beaches and barrier reefs in the area as well as many large and well-known golf courses make it a lovely location for a visit. Whether guests are there for business or pleasure, Jacksonville has ample accommodation, with plenty of upscale hotels with pools, bars, and other amenities, as well as small and intimate bed and breakfasts, which offer a home-cooked meal and a quiet, peaceful atmosphere. The Riverdale Inn is located in a gorgeous mansion that exemplifies the Shingle style of architecture. Built in 1901, the inn was once part of a row of beautiful houses in this style, but now it is only one of two that remain. With beautiful interiors that feature original crown molding, hardwood floors, and wainscoting, the Riverdale Inn is full of Old World charm and tranquil elegance. The eleven guest rooms at the Riverdale are comfortably furnished, each with unique elements and private bathrooms. Guests at the Riverdale Inn can take advantage of the complimentary snacks and coffee, which are offered all day, as well as the full country breakfast. 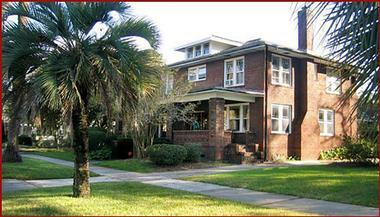 The Jenks House Bed and Breakfast offers two simple, comfortable Mission-style rooms for guests to rent and enjoy. 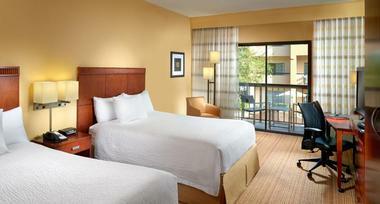 Each room has its own attached private bathroom and includes amenities like Wi-Fi, board games, and bathrobes. The Jenks House is a non-smoking establishment and does not allow pets. Breakfast at The Jenks House is a lovely affair, with menus that change by the day and include fresh local fruit, homemade crepes, breads and pastries, home-roasted coffee, and freshly squeezed orange juice from the orange trees right on the property. The Jenks House is Florida Green Lodging certified and prides itself on its dedication to a comfortable and eco-friendly experience. 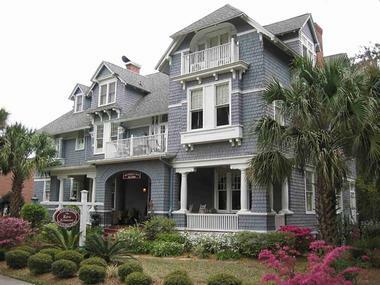 Located in the Riverside/Avondale Historic District of the city of Jacksonville, St. John’s House is a bed and breakfast situated just one peaceful block from the St. John’s River. This lovely, tranquil accommodation offers its guests a relaxing stay in an historical house with shady porches and a beautiful garden. It is within walking distance of many of the neighborhood’s attractions, including shopping, restaurants, and art galleries, and is very close to the St. John’s Riverwalk. Fresh breakfast is included every morning for guests. St. John’s House is open annually from November until May, with the exception of the month of March. This retreat, brought to life by the illustrious Marriott chain of hotels, is located in an ideal place, just steps from the Mayo Clinic and the premier medical services that it offers, and also conveniently located to some of the best beaches in Jacksonville. 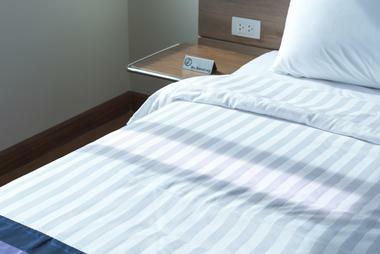 The hotel offers complimentary Wi-Fi, a free shuttle to and from the clinic, and spacious, comfortable rooms. There is a 24-hour market on site, which offers basic snacks and conveniences, and a bistro, which has a wide variety of menu selections to suit any appetite. Hotel Indigo is a stylish and modern hotel located at the shores of a beautiful lake, just a 15-minute drive from downtown Jacksonville and the white sands of the beach. Accommodations are quirky and comfortable, with huge wall murals, cozy bedding, and brightly colored accents. Upgrading to a suite will add sleeper sofas, dining areas, spa-like bathrooms, and sitting areas. The hotel also has plenty of common space, including a swimming pool, an outdoor fireplace by the edges of the lake, a fitness room, and meeting spaces. At the 98 Forty Bar and Bistro, located on site, guests can sate their appetites with some delicious American cuisine, featuring seafood and produce from local areas. 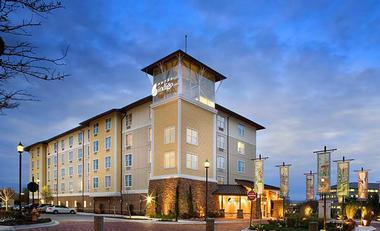 This upscale hotel is located on the banks of the St. Johns River, with plenty of rooms that overlook the water. 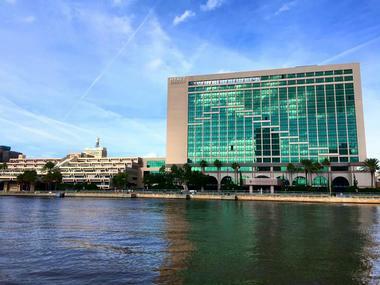 Conveniently located to downtown Jacksonville and all the attractions there, the Hyatt Regency has comfortable, modern rooms with flat screen TVs, Wi-Fis, and work areas. Some upgraded rooms come with special access to a VIP lounge area, where guests can partake in complimentary breakfast as well as snacks during the evenings. The hotel is equipped with amenities such as a rooftop pool, hot tub, fitness center, and three delicious restaurants to choose from. 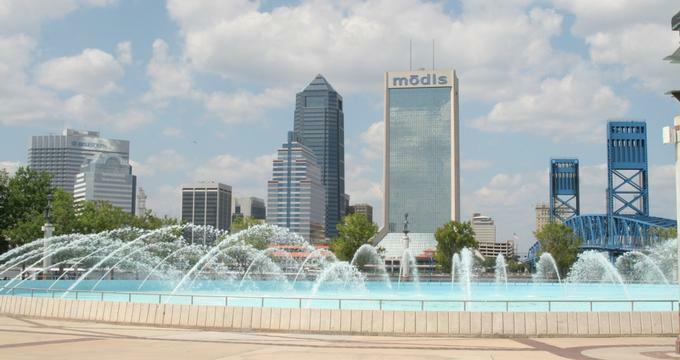 The Omni Jacksonville Hotel is located in downtown Jacksonville, within close walking distance to the Performing Arts Center and a major shopping center. This luxurious accommodation features sleek rooms with pillowtop mattresses, modern furniture, and large windows with lovely views of the river. 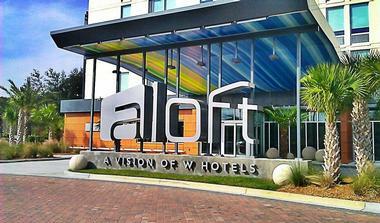 There are three restaurants at the Omni Jacksonville Hotel, where guests can enjoy coffee, a meal, or a refreshing cocktail, and food is also available to be served in room. During the day, guests can enjoy sunbathing next to the heated pool or take advantage of the fitness center. 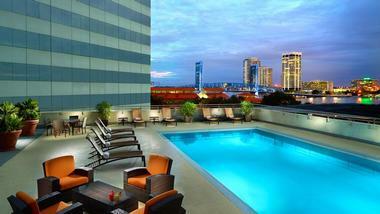 Rooms at the Doubletree Hotel on the Jacksonville Riverfront feature free Wi-Fi, coffeemakers, and flat-screen TVs. Rooms also have walk- out balconies, many of which overlook the scenic St. Johns River, and upgraded suites feature sitting areas with sleeper sofas, kitchenettes, and whirlpool tubs. The hotel itself also has a large swimming pool, hot tubs, and a fitness center, and guests will enjoy the two onsite restaurants, which offer American cuisine and a steakhouse experience, respectively. 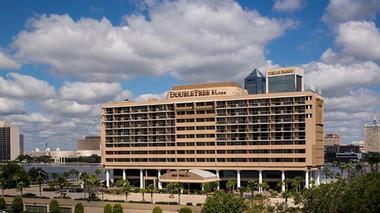 The Doubletree’s central location to downtown Jacksonville and its attractions makes it a great option for both business trips and vacations. Every accommodation at Embassy Suites by Hilton Jacksonville Baymeadows is a suite, meaning that guests will each have access to a two-room suite with Wi-Fi, TV, and a living room with a pullout couch in the sitting area. There is also a workstation in each suite as well as a kitchenette equipped with a coffeemaker, microwave, and minifridge. The hotel offers complimentary breakfast every morning for guests, cooked to order, and free appetizers and beverages each evening during a nightly reception. 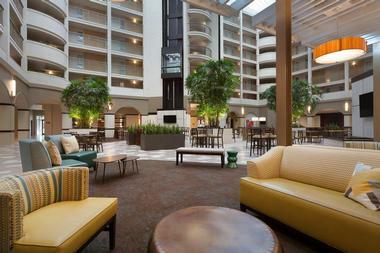 For entertainment and fitness, the Embassy Suites also has a pool and fitness center available for guest use.